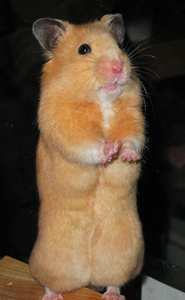 Once your hamster becomes tamed, you can start teaching him to do tricks. Having a pet that can perform is a never ending source of delight as well as pride! Patience, perseverance and repetition are the most important things to keep in mind when you do hamster training. The use of reward is very important. The reward should always be a treat that your hamster really loves! Hold the treat above his head high enough that he will have to stand on his hind legs to reach it. Repeat his name and the command "Stand" until he does, tease him for a moment and then give him his reward. repeat this procedure and the same command over and over again until he stands whenever you hold your hand over his head. He will soon associate the word "Stand" with the act of standing up and do so whenever ordered. 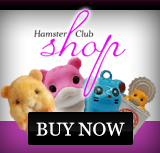 Other commands can be taught to the hamster in the same way, always remembering to repeat the identical word and procedure. By this same method, one can teach him his name. Hold a bit of food out to him and call him by name. He will come for the food and after a number of repetitions he will begin to understand that the name refers to him. 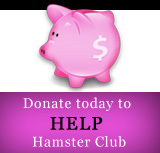 There are no short cuts to hamster training. As mentioned above, patience, perseverance are the keys. If you fail at first, don't be discouraged, keep trying until you succeed. Be gentle to your hamster and always keep your voice low.